Another busy week has flown by! First a photo shoot with the lovely Lilian from Lily Chic Events last Sunday, can't wait to share those pics with you all, it looked AMAZING! Then it was busy creating the above topsy turvy leopard print cake for my friends daughter who turns 16 this weekend. Everything on the cake is edible, cake is choc mud covered in choc ganache and then covered in white choc fondant. First time I've made a topsy turvy cake and first time I've had to paint a leopard print :-) Making (carving) the cake kinda freaked me out a little but the "painting" of the leopard print was very easy. 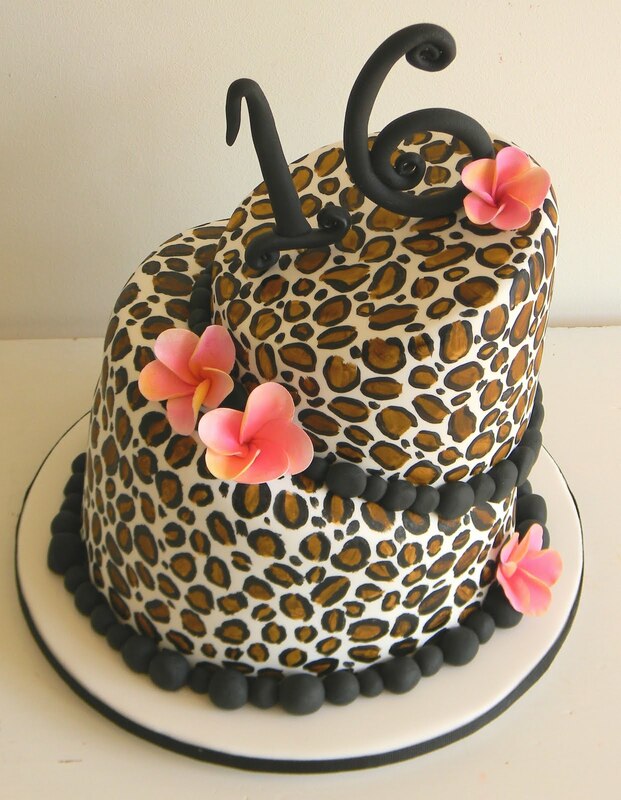 I used edible brown colouring paste mixed with vodka for the leopard print pattern. Another cake I was working on is this film reel cake for a Hollywood 40th birthday bash. I am so pleased how this turned out, I saw an example at Cakes Crazy during my google image search and tried to recreate it for this birthday, I think I came pretty close. The reels are 2 x vanilla cakes with vanilla bean buttercream frosting and 1 x red velvet cake also filled with vanilla bean buttercream and covered in white choc ganache. All cakes then covered in fondant and edible wafer paper (the photos). Once again everything is edible, except the top cake's silver spoke, it threatened to crack and break so I had to pop it on a cardboard cakeboard for support before placing it on top of the cake. The other silver spokes are 100% edible, made from modelling past (with some tylos powder) and edible silver lustre dust. 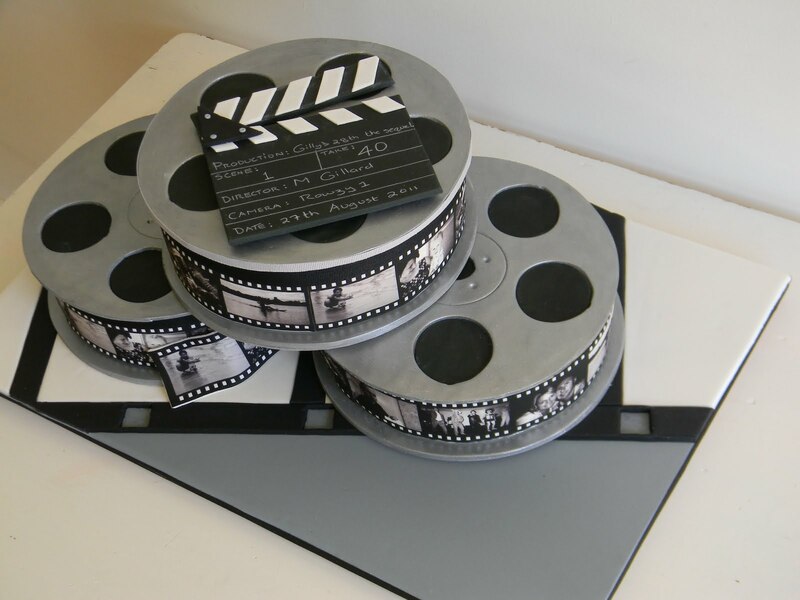 Clapper board is black fondant and chocolate with edible "chalk" writing. Not an overly difficult cake to make just very time consuming and you have to be very accurate. Close enough is not good enough if you are going to attempt this cake. The hardest part in making this cake is the stacking part, I tried to work out how to stack it without the edible spokes breaking and cracking on the bottom two cakes. In the end I used a "floating" stack technique used for wedding cakes where the cake maker usually assembles the cakes at the venue. I found this the safest option as well as making the transportation of the cakes easier and less heavy (this baby weighs a tonne!!). A MASSIVE thank you to Little Big Company for doing the graphics for the film reel cake, without their help the images would not have looked so real and professional. You have got to start taking some more detail close up shots, my lovely. I'd love to get a better look at these cakes. Maybe if they were larger on the blog too? How did you make the edible chalk writing? Thanks!